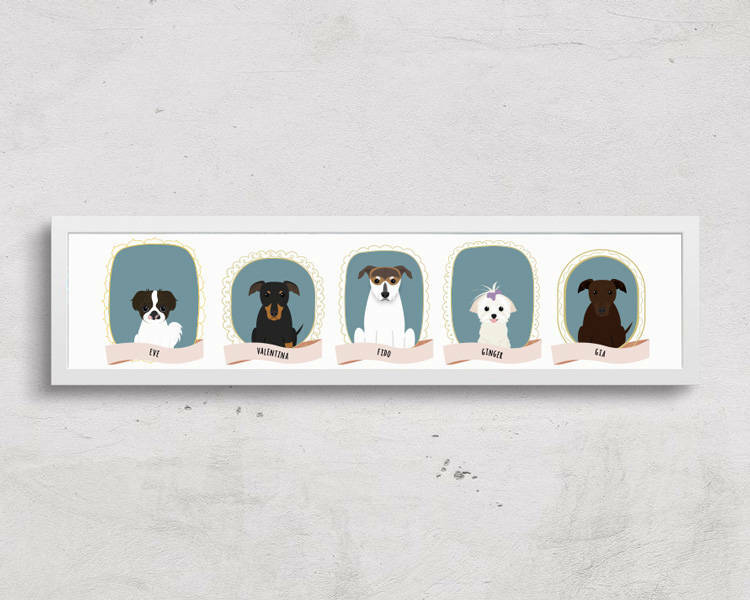 Looking for the perfect personal gift idea for someone with 4 beloved pets? Look no further. A fully custom portrait illustration is totally unique and will be treasured forever! Both Printed & Printable options are available. Printed size is 5" x 15" inches and requires a panoramic frame. 2. Send a convo message with the breed (if known) and a photo(s) of the pets to be included. Please specify if you have any special requests. 4. When you tell me you love it, printing begins, and a print will be shipped to you. If you've chosen a Printable version, a print-ready PDF will be emailed. Five pets are included. I offer other listings in my shop for other quantities. Yes! A digital-only option is available, simply choose that option from the drop-down menu.